The 2012 IKEA catalog is out! I spent a lovely Monday off of work perusing the pages and thinking on what areas of our next place we will want to IKEA-ify. There is definitely a need to balance the purchases so that your house does not turn into a showroom, a problem my friend and I were just discussing this week. However, I think even if you end up with a few of your larger pieces from the same store, the accessories you use to personalize the areas can make all the difference. 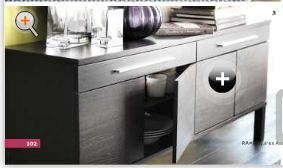 In another example, I saw on an IKEA Hackers post how the kitchen cabinetry was spiced up with new hardware. Coincidentally, younghouselove just wrote about the issue this week when they decided to forgo the standard IKEA hardware for something a little special. So as a fitting sequel to my ultra-pricey Modern Design inspiration post, here are some of the more affordable pieces that struck a chord. At $249, the Bjursta sideboard could make a great statement as our buffet table. My goal for the buffet is to have one side focused on "the bar" with floating shelves above it. The other side would have a large piece of artwork on the wall behind and be reserved for party food. One area of concern is the dark wood color - our media center, bookshelves and still-to-buy-but-we-know-what-we-want dining table will also be very dark, so maybe this is the area where we spice up the color? Although, the dark color issue could be solved if we go this route with our dining chairs. . .pops of hot pink anyone? The Bernhard Chairs - I wonder if they look more red in person. I feel like I am always seeing a jolt of hot pink in design mags that I'm reading. Do we dare? Fell in love with this idea. We own a lot of puzzles and would love to do one sometime, but our krazy kitties would probably put a damper on our puzzle progress. 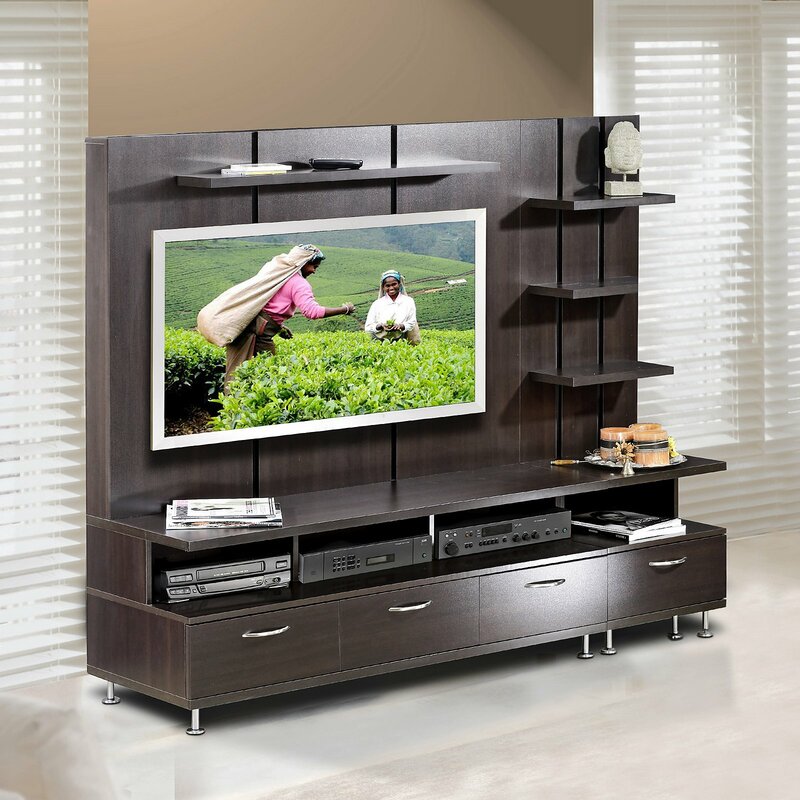 Putting any kind of shelf or countertop or headboard on wheels just tall enough to fit under the couch - brilliant! The wheels in the photo caused the wheels in my head to turn. I have a vision of turning my MALM headboard from my discarded full size bed into the top of a craft table. 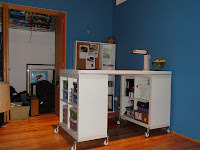 Since this table would take up room in our office/guest bedroom, the idea of putting the thing on wheels would mean we coul push it out of the way when we needed to set up the bed for incoming guests. If we put a mirror up at the right height against one wall, the table pushed underneath it would look like a regular ole vanity. This would also solve my dilemma of wanting the table to be at least 36" high and the Expedit 4 square shelves only hit at about 31". The wheels will add the extra few inches and as long as there is a reliable locking mechanism shouldn't cause any issues with it suddenly rolling away from me as I try to work. Now my only concern will be that the lightweight Expedit shelves will be able to hold up under the weight of the headboard. Anyone out there already attempt something similar and find success (or failure)? Finally, inspiration struck as I was reviewing the IKEA Hackers website and saw a headboard made out of LACK side tables. The LACK side table has to be one the most frequently used items for hacking. Maybe it is more fun because the words rhyme? The challenge is that we do not want to invest in a new media center as the one we picked up from IKEA a couple years ago suits us well. I also don't really want to attempt to paint it to match whatever back panel we ended up finding. The LACK side tables can be purchased in the black-brown color that our bookselves and media center came in. If we carefully connect 4 of the table tops across and 2 deep for behind the TV and 2 more square panels for the bottom corner we would have total coverage behind the unit and have room to add a few LACK floating shelves for decorative elements on the side. My question, however, remains the same as that I have for the Expedit cubes. Will the LACK side table tops be strong enough to hold up a shelf and the few pounds of weight on it? We would not try to mount the TV on the wall, it would stay standing on the media center. That sounds like a little too much pressure to put on the little LACKs. So here ends the IKEA inspiration. Now we need to find a weekend, and maybe an extra vehicle, to head out to the 'burbs and buy the place out.